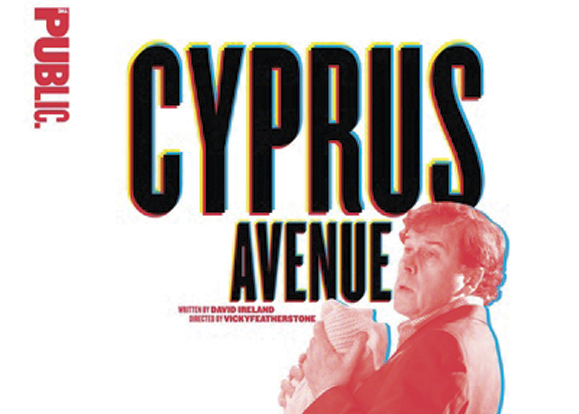 Poster for Cyprus Avenue at the Public Theater in N.Y.C., running from June 25 to July 29. David Ireland’s Cyprus Avenue opened for its debut in North America at the Public Theater in New York City on June 25th. 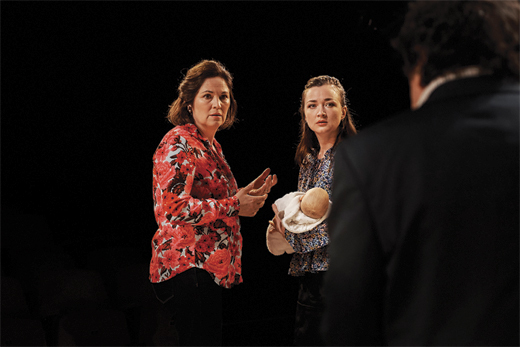 Starring Stephen Rea, the play is a discomfiting cross between cathartic and alienating, summoning painful notes of recognition along with a worrisome awareness that everything in this world is just slightly, tragically, off-kilter. Directed by Vicky Featherstone, the artistic director of London’s Royal Court Theatre, the one-act play centers on Eric Miller, a Belfast native who takes firm pride in his British identity, and maintains an ingrained, passionate resentment of Catholics and Irish nationalists. His outmoded philosophies appear to have lain dormant or largely ignored by his family until the opening of the play, when he is confronted with his first grandchild. 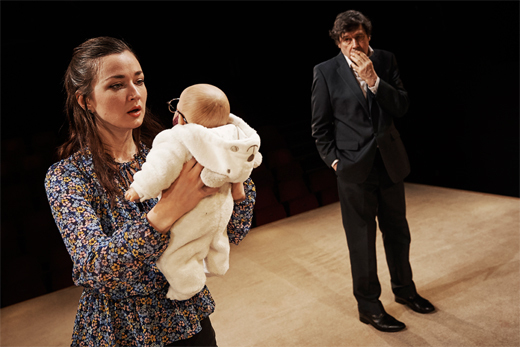 An instance that would in any other play introduce a few heartwarming scenes ringing with themes of love and legacy here triggers a halt to the Millers’ contented life on Cyprus Avenue, when Eric becomes convinced that his newborn granddaughter is the spitting image of Gerry Adams – no, that she somehow is Gerry Adams – former president of Sinn Féin, and the embodiment of everything wrong and threatening about Eric’s world. The ridicule of his theory by his wife and daughter does not cause him any hesitation in the slightest, as he attempts to prove it correct and, eventually, to neutralize the infantile threat. 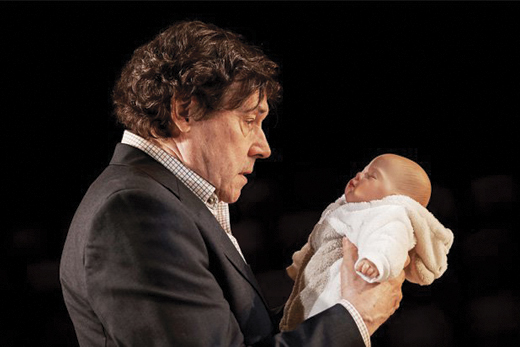 Stephen Rea as Eric Miller, holding his newborn grandchild. (Photo: Ros Kavanagh, Cyprus Avenue Tour Production Pictures). 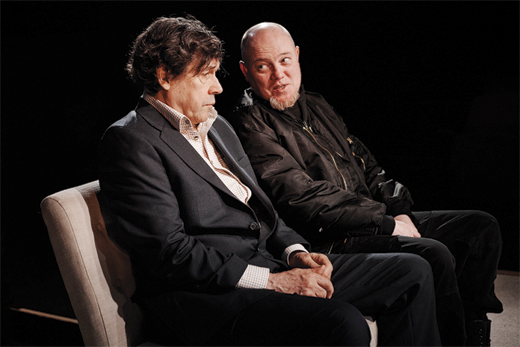 Stephen Rea’s darkly comedic turn as Eric Miller lends the starring role a mild, fatigued facade. A slightly hunched posture, careful gait, and hoarse voice present a man in his twilight years, whose occasional bouts of discrimination can at first be dismissed as harmless because they are couched by the continually uttered equivalents of “no offense”. His ignorance is obvious, but he is like countless men I know. He’s not a bad man, he would never harm anyone, he just lives in a world that has passed him by, and that’s not his fault – is it? Irvine and Molloy as Bernie and Julie, respectively. (Photo: Ros Kavanagh, Cyprus Avenue Tour Production Pictures). Rea is supported by Andrea Irvine and Amy Molloy, who play Miller’s wife and daughter, Bernie and Julie. Irvine and Molloy manipulate expertly the line between concerned and warily disengaged as Rea’s Eric becomes more and more agitated and paranoid over the play’s progression. They provide a sorely-needed dose of reality in a world that revolves around a character who is losing his grasp on it. Chris Corrigan tackles the role of Slim, a thug moonlighting as a philosopher, whose views are strikingly similar to Eric’s, with ease – in my opinion, he embodied his role the most fully of the entire cast, articulating every syllable of Slim’s occasionally delusional rants with a sense of pride and happy violence that makes the character both appealing and nerve-wracking. Corrigan as Slim onstage with Rea. (Photo: Ros Kavanagh, Cyprus Avenue Tour Production Pictures). The element of reason and (delayed) conscience threaded throughout this dismal tapestry of events is voiced by Ronkẹ Adékoluẹjo, who plays Eric’s counselor Bridget, for whom he recalls his actions matter-of-factly. 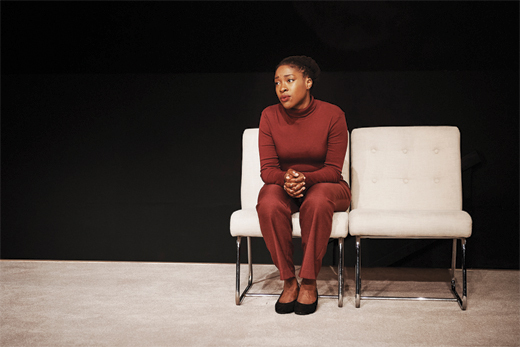 Miss Adékoluẹjo, who only recently joined the cast for the play’s American run, does a masterful job of conveying muffled frustration and horror as Bridget strives to sort through Eric’s prejudices and how they move him. Adékoluẹjo as Bridget. (Photo: Ros Kavanagh, Cyprus Avenue Tour Production Pictures). While there are many adjectives that can be used to describe the play, that which comes to mind first is “off-putting”. In the end, one must find it impossible to warm to or identify with the embittered, “non-negotiably British” protagonist of Eric Miller, which I believe is precisely the point. On its own, Cyprus Avenue tells a tragic tale that comes to feel absurd because the audience is blockaded by the fourth wall. No one gets lost in these characters, because they all remain either remotely secondary or just on the wrong side of believable – but only just. The dialogue retains just enough of the mundane routine, light-hearted banter, and awkward self-justification that pepper daily life that the universe in which these characters exist is still one we recognize, even if it is uncomfortable to admit. We are therefore forced to see Eric’s descent into madness as a representation of something beyond itself: not quite a parallel universe, but a possible outcome for the world as we know it. The plot, motivations, and hate-filled language that Eric Miller employs liberally throughout combine to portray a brutal example of extreme nationalism: this is what can and will happen if we prioritize national identity over all else – if we allow past grievances to overcome us – if we are patriots before we are spouses, parents, or grandparents. Eric Miller will be born, and his damage will be on the shoulders of those who informed his thinking. Molloy in foreground as Julie, holding Mary Mae, whose grandfather has scribbled over her face in permanent marker to prove she is Gerry Adams. Rea in background. (Photo: Ros Kavanagh, Cyprus Avenue Tour Production Pictures). Yes, it is an incendiary, slippery slope of an argument, and certainly does not apply only to Northern Ireland; with just a few adjustments it could quite easily be a story of post-Trump America, which I cannot believe is an accident. Whether or not you dismiss the implicit warning, you must at least consider it, and this vivid, emotionally charged production makes it difficult to shrug it off and go home.